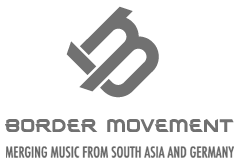 Border Movement Lounge, an initiative by Goethe-Institut, showcases established and upcoming artists and producers of electronic music from across South Asia and Germany. The event has explored different heritage buildings such as the Burdwan Palace, Hooghly Jute Mills and Gem Cinema, in order to show alternative, artistic use of these beautiful structures and inspire new life for them. Golden Diskó Ship is Theresa Stroetges, a Berlin-based multi-instrumentalist and video artist who performs live as a one-girl orchestra. Her imaginative soundscapes, shifting from delicate melodic lines steeped in nostalgia to the feedback arcs and textured distortion of machine abuse, evoke lucid dreams and have won critical praise for their fresh, eclectic collages of electronic and acoustic sound. An avid collector of music – she started her career at venues like Zenzi Mills in her hometown Mumbai, gradually playing bigger and bigger floors including after hours sets at bar 25 Berlin and a live broadcast at Boiler Room. Kini’s music vision is to write, play and promote hi-fi music with a generous touch of lo-fi soul.